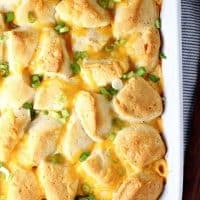 BACON PIEROGI BAKE — Pierogi baked in a creamy sauce, then topped with cheese, bacon and green onions. I never even heard of pierogi until I met my Canadian husband in college. I know, I was missing out! Up until now, I always boiled pierogi then fried them in some butter. But I think this Bacon Pierogi Bake recipe is the way I’ll be serving pierogi from now on. If you’ve never had pierogi, imagine ravioli stuffed with cheesy mashed potatoes. I usually by frozen peirogi from the grocery store and cook them in boiling water, followed by a saute in melted butter. Some people just boil them, and skip the saute, but I like my pierogi a little crispy. They’re traditionally served with sour cream on the side. The whole family loved this version of cooking pierogi though, even my husband, who I thought might balk at me messing with the traditional pierogi cooking method. I shouldn’t have been worried. He loved it just as much as the rest of us! How can you go wrong with potato filled pasta, bacon and cheese, all smothered in a creamy sauce? It’s sort of a loaded baked potato version of pierogi. 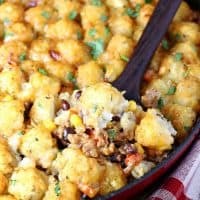 I’ve had friends make this and personally tell me how much their family loved it. That’s how I know it’s really good! I’ve actually started keeping some pierogi in my freezer so I can throw this together at the last minute. It’s one of those meals that I know will disappear, and I won’t hear any complaints. In fact, this is what my husband calls a “lick your plate” kind of meal. And that’s exactly what he does! 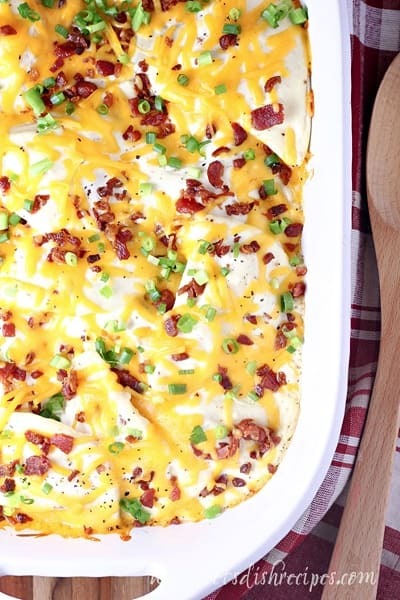 Be sure to save this Bacon Pierogi Bake recipe to your favorite Pinterest board for later. 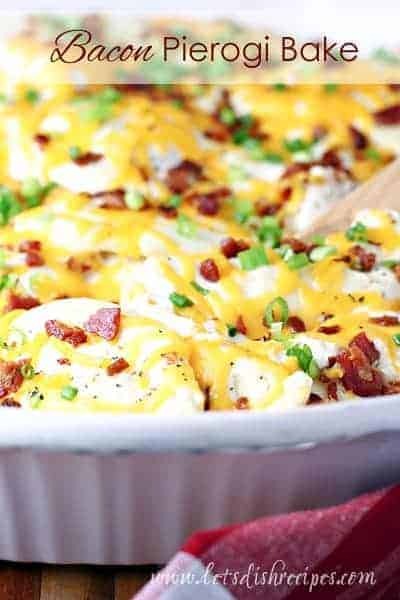 Pierogi baked in a creamy sauce, then topped with cheese, bacon and green onions. Preheat oven to 400 degrees. 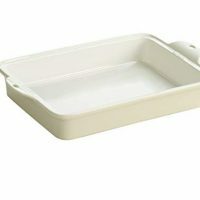 Arrange the pierogies in a lightly greased, 9x9 inch baking dish. 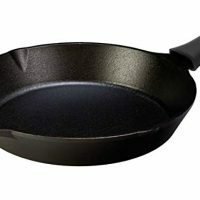 In a medium skillet, cook the bacon until crispy. Remove to a paper towel lined plate. Add garlic to drippings in pan and cook for 30 seconds. Add cream cheese to pan and cook until cream cheese begins to melt, stirring frequently. Gradually whisk in the chicken broth until smooth. Season sauce with salt and pepper to taste. Pour the cream cheese mixture evenly over pierogies. Bake for 15 minutes or until bubbly and heated through. Remove from oven and top with cheese. Bake for an additional 5 minutes or until cheese is melted. Top with cooked bacon, green onions and tomato before serving. A creamy, cheesy green chile and chicken filling is topped off with a delicious biscuit-like topping in this Tex-Mex style comfort food the whole family will love! 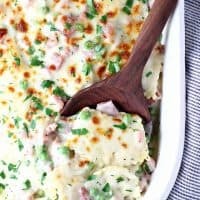 Cheese filled ravioli, diced ham, and peas come together in a creamy sauce for a comfort food style pasta dish that will satisfy the whole family. 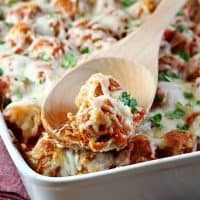 Everything you love about a meatball sub sandwich in convenient casserole form. What a coincedence, I just made and posted this yesterday. Saw it on Cassie’s blog as well. It was so delicious! You had me at Bacon! This recipe sounds soooooo good! Bookmarked! YUM! I’m part Polish, so I have eaten Pierogi my whole life (fried in butter, like you make it) and I’ve never seen this, but if you say it is so good, I will have to try it one day! Thanks for sharing! I’d say there’s NO way to go wrong with that combination…yum! This looks awesome! I’d never heard of pierogies before my husband either. (he’s from Duluth, MN) We tend to eat them in the winter time, but for a nice twist for summer, put them frozen on the grill with some olive oil and seasoning. So good! I’m new to your blog, but you are definitely on my favorites list! Thanks for all your great ideas! Made this tonight and it was so yummy! 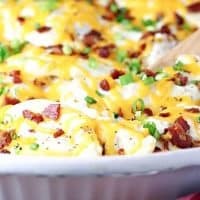 You can’t go wrong with mashed potatoes, cheese and bacon. Yum! Would love to take to work potluck….could this be assembled in a crock pot? Do they have to be frozen or can I use fresh pierogis? I had pierogis once it was ok. 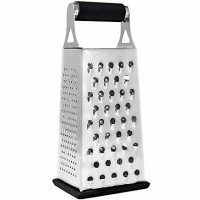 However this one looks great im making it for dinne. 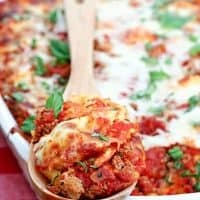 Made this tonight with italian sausage instead of bacon and it was delicious! Thanks for sharing such a great recipe! The bacon grease/cream cheese sauce is soooooooo yummy. 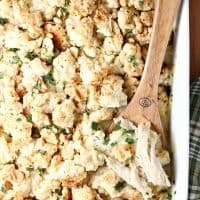 I could have eaten the whole pan myself, but I shared it with my husband and four kids. If they ever decide they like mashed potatoes I will need to make a double batch! SO yummy!!!! Use a 9 by 9 dish I did it in a larger one and there wasn’t enough sauce for it. I’ve made this a few times and mine isn’t hot in the middle after 15min of cooking. Takes more like 45min. Any suggestions. I use Frozen pyrogy’s and a cream soup base normally not the cream cheese. I would either cook it longer, like you have been. Or let your peirogies thaw before making the casserole. 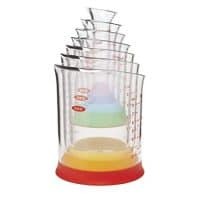 Also, if your cream soup base isn’t hot (the cream cheese version is hot when you add it to the peirogies) that would result in a longer cooking time. Thanks Danielle. I will try the heated soup method. Didn’t think of that. Lol. Made this the other night and it was so good! The whole family enjoyed it! Thanks for sharing such a quick and easy dish! Could this be frozen and re-heated later? Any suggestions for re-heating temps? I haven’t tried that, but I think it would work fine. I would reheat at the same temp, but lengthen the cooking time if you will be heating directly from frozen. Do you cook the perogies first or put them in the dish frozen? Frozen. But note that the sauce you add should be warm/hot. Sometimes people make the sauce ahead, add it cold, and then the perogies don’t cook through. If you do it that way, you may want to cook them first. But as the recipe is written, you should be able to put them in frozen. I’m not sure why everyone said they loved this recipe. I made it today thinking it was going to be the most amazing dinner ever. This was the most disgusting thing I have ever made!! It tasted awful.. my husband who is not very picky tried the sauce and almost threw up. Cream cheese and chicken broth isn’t a very good sauce. Don’t waste your time! I made these in the slow cooker and left them too long (so they weren’t perfect) but that was my own fault. I used beef broth because that’s what I had, and I skipped the tomatoes. I loved the blend of flavours and they went well with my homemade cabbage rolls. I will definitely try this recipe again. I made this tonight for the first time for my 16-20 volunteer firefighters that I cook for on Thursday nights guys & we all loved it! Slot of the guys went back for seconds!! Definitely making this a lot more from here on in! Other than the amount of calories & fat! But you have to indulge from time to time & for this it’s so worth it! Yummy!